Perhaps you noticed a dearth of blog posts for the last month. Truth be told, I have been spending copious amounts of time with a kitchen appliance. Please don’t take it personally. 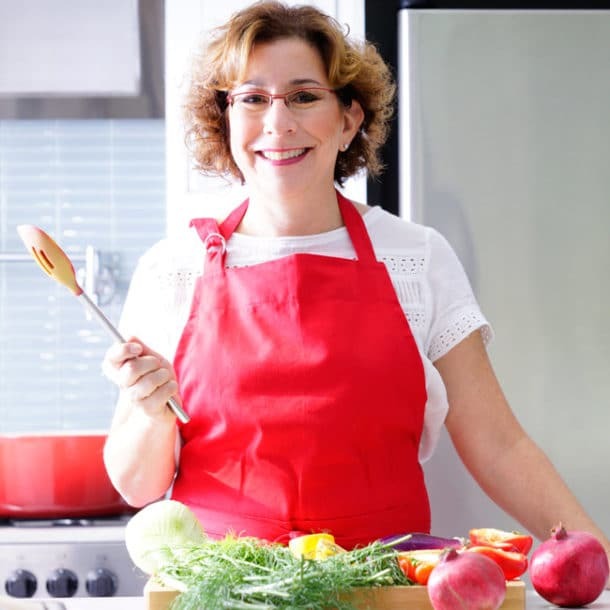 As a result of a chew-challenged family member, I was blending and whirring in my new Vitamix 5200* about eight times a day, leaving me little time to write or stay connected on social media. But I am easing back into my routine and anxious to start sharing some inspiring summer recipes with you. Let’s start with something simple, sweet, and unexpected that you can make in, you guessed it, a blender. 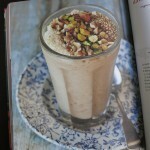 A date smoothie, inspired by Louisa Shafia’s date shake in her book “The New Persian Kitchen “. I’ve made it in my $30 Oster blender (thanks for your years of excellent service) and my $375 Vitamix. Great in either case, if you like dates. I changed it up a bit – adding peanut butter for a bit more protein and the nutty flavor and some almond milk, again for protein and texture. 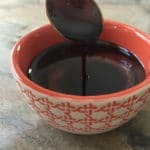 I use medjool dates, which I buy at the international market and I also see regularly at Costco and Whole Foods. 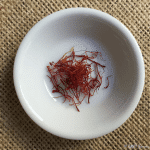 Fresh medjools are so sweet — if you close your eyes when you eat them, you will be certain you are eating candy. 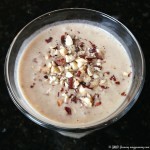 Louisa tops her shake with lots of toasted nuts, seeds, and coconut. Highly recommended, but just use whatever you have on hand or skip it if you don’t. 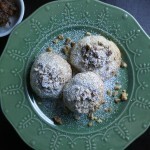 It’s still a mouth pleaser and steps in as a terrific breakfast on the go. 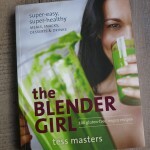 Want more blender inspiration, check out my friend, Tess Master’s new best-selling book “The Blender Girl: Super-Easy, Super-Healthy Meals, Snacks, Desserts, and Drinks–100 Gluten-Free, Vegan Recipes! ”. 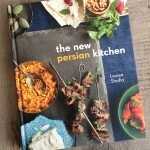 The food is healthy, the book is beautiful, and offers much more than pureed soups and smoothies. It’s full of toothsome dishes from appetizers, to main courses, to desserts. I’m glad to be back and I hope you were happy to see my post pop up in your inbox or favorite social media news feed. What have you been up to in your kitchen while I’ve been busy blending? A satisfying breakfast smoothie that could easily become a delicious dessert with the addition of some vanilla ice cream, which is how the original drink, called a majoon, is served. 1 1/2 cups crushed ice approx. Place all ingredients in the blender and process until smooth. 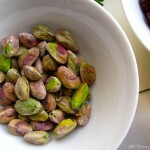 Top with nuts or seeds of your choice. Drink immediately - can also be stored in the fridge for a day or two if you have leftovers. Me too! Hoping to bring my kids that day too – keeping my fingers crossed! See you soon. Glad you tried it! the medjool dates tend to be bigger than regular dates and just so darn sweet. I’ll get you some next time I’m at the int’l store. You’ll fall in love with them. You can totally play with this recipe – change the liquid, change the yogurt, add more of something you like, less of something you don’t. Have it your way! 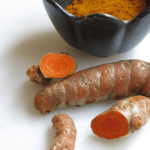 I know – that is a big downside of juicing for me though it can taste so darn good! Let me know if you try this smoothie and how you like it. Thanks for stopping by. Have a great weekend! Welcome back! Hope that date shakes are just the tip of the iceberg for your time in the kitchen. Take care! Thanks Carol! Looking forward to catching up on everyone’s blog posts soon – can’t wait to read about C’est Cheese! Hi Deb! Yes – it’s taken me a while to find a smoothie, other than dumping protein powder in one, that is filling enough to call breakfast, but this one is. And well, re the food on a plate, what an eye opener it is to have to feed someone who can’t chew at all. Wow. And what a difference the Vitamix makes in pureeing well enough to be drinkable in that situation. And now I am just enjoying its merits in other ways. One of my latest favs – honeydew, lime, and mint with some ice for a refreshing juice drink. Hmmm — might have to write about that 🙂 Hope all is well with your new doggie and life in general.